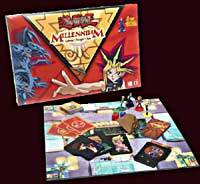 The Millennium Board Game (from Mattel) game lets kids get into the action of Yu-Gi-Oh! In order to become the “King of Games,” players must obtain all five pieces of the 3D Millennium Puzzle. Each player begins the game in the Ultimate Dueling Arena with one piece of the puzzle. Players need powerful monsters to win the “Arena” duels, and gather them by visiting the “Game Shops” located at the four corners of the board. Players move between the Arena and the Game Shops, battling in three separate duels along the way – Janken, Saikoro and Ikusa – trying to get the most powerful Monster Slider Cards. They return to the Arena to compete for the remaining puzzle pieces. The first player to assemble the Millennium Puzzle wins. I’ve had the Yu-Gi-Oh board game for quite a while now. I don’t usually play it anymore. millennium puzzle. It also has the pieces that look like the people on the show. 2.You can duel other people and win their piece. 3.The character figures are cool looking I usually play with the little figures. LOL. Well there you have it. Its good/its bad. All your opinion. I would try the game out. See how it is. Then decide if you would like to buy it or not. 6. to win the game, you got to get all the pieces of the puzzle 7.
which has different advantage to different monsters. to where you are outside of the arena (not an arena duel) and duel! on the top right corner of trap tile, wins.